a)Keep in mind that this file does not add any graphics at all so that's not an indicator there is an issue. However, those competitions should be renamed if you have installed the files correctly. 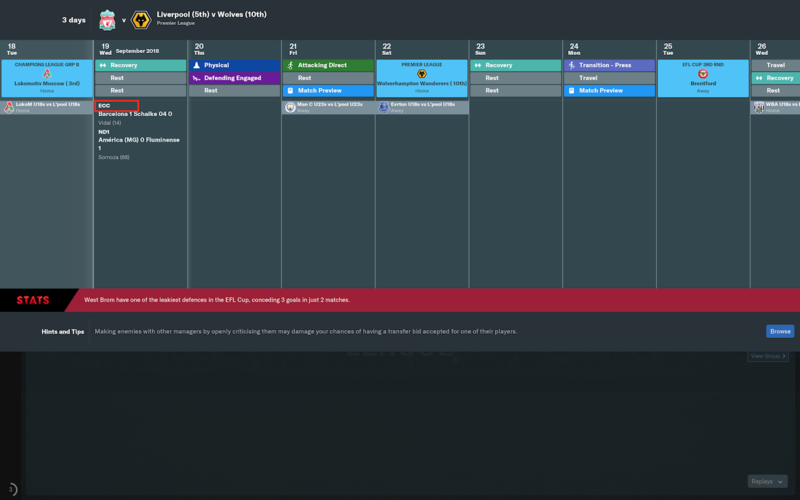 Can you take screenshots of your 1901 and 1910 lnc folders please? Ok then it is a misunderstanding from my side. Because of the posted screenshots i thought it changes also the grapics and adds picture to clubs and events. Sorry for wasting your time and thanks again for the fix. No probs, but have the competition names changed? Yes, the events have they real names. A false positive is when an antivirus detects a virus in a file which doesn't have one. "COMP_LONG_NAME_CHANGE" 67 "LaLiga Santander" ""
"COMP_SHORT_NAME_CHANGE" 68 "LaLiga 2" ""
"COMP_LONG_NAME_CHANGE" 121091 "Segunda División B de España" ""
"COMP_SHORT_NAME_CHANGE" 121091 "Segunda División B" ""
"COMP_LONG_NAME_CHANGE" 69 "Segunda División B de España Grupo I" ""
"COMP_SHORT_NAME_CHANGE" 69 "Segunda División B Grupo I" ""
"COMP_LONG_NAME_CHANGE" 70 "Segunda División B de España Grupo II" ""
"COMP_SHORT_NAME_CHANGE" 70 "Segunda División B Grupo II" ""
"COMP_LONG_NAME_CHANGE" 71 "Segunda División B de España Grupo III" ""
"COMP_SHORT_NAME_CHANGE" 71 "Segunda División B Grupo III" ""
"COMP_LONG_NAME_CHANGE" 72 "Segunda División B de España Grupo IV" ""
"COMP_SHORT_NAME_CHANGE" 72 "Segunda División B Grupo IV" ""
Is this perhaps possible? If so, how? "AWARD_LONG_NAME_CHANGE" 41014699 "GO-JEK Liga 1 Team of the Year" ""
"AWARD_SHORT_NAME_CHANGE" 41014699 "GO-JEK Team of the Year" ""
"AWARD_LONG_NAME_CHANGE" 41014696 "GO-JEK Liga 1 Team of the Week" ""
"AWARD_SHORT_NAME_CHANGE" 41014696 "GO-JEK Team of the Week" ""
"AWARD_LONG_NAME_CHANGE" 7745741 "Liga 2 Team of the Week" ""
"AWARD_SHORT_NAME_CHANGE" 7745741 "Team of the Week" ""
"AWARD_LONG_NAME_CHANGE" 7743525 "Liga 2 Team of the Year" ""
"AWARD_SHORT_NAME_CHANGE" 7743525 "Team of the Year" ""
"AWARD_LONG_NAME_CHANGE" 41014698 "GO-JEK Liga 1 GO-POINTS Goal of the Year" ""
"AWARD_SHORT_NAME_CHANGE" 41014698 "GO-POINTS Goal of the Year" ""
"AWARD_LONG_NAME_CHANGE" 41014697 "GO-JEK Liga 1 GO-POINTS Goal of the Month" ""
"AWARD_SHORT_NAME_CHANGE" 41014697 "GO-POINTS Goal of the Month" ""
"AWARD_LONG_NAME_CHANGE" 41014690 "GO-JEK Liga 1 Top Goal Scorer" ""
"AWARD_LONG_NAME_CHANGE" 41014689 "GO-JEK Liga 1 Best Player of the Year" ""
"AWARD_LONG_NAME_CHANGE" 41014691 "GO-JEK Liga 1 Best Coach of the Year" ""
"AWARD_LONG_NAME_CHANGE" 41014692 "GO-JEK Liga 1 Best Young Player of the Year" ""
"AWARD_LONG_NAME_CHANGE" 41014700 "GO-JEK Liga 1 Best Referee of the Year" ""
"AWARD_LONG_NAME_CHANGE" 41014695 "GO-JEK Liga 1 Best Player of the Month" ""
"AWARD_LONG_NAME_CHANGE" 41014694 "GO-JEK Liga 1 Best Coach of the Month" ""
"AWARD_LONG_NAME_CHANGE" 41014693 "GO-JEK Liga 1 Best Young Player of the Month" ""
"CLUB_LONG_NAME_CHANGE" 41060486 "PS TIRA Bantul" ""
"CLUB_SHORT_NAME_CHANGE" 41060486 "PS TIRA" ""
"CLUB_LONG_NAME_CHANGE" 41058569 "Blitar United FC" ""
"CLUB_SHORT_NAME_CHANGE" 41058569 "Blitar United" ""
#"CLUB_LONG_NAME_CHANGE" 41005039 "PS TNI" ""
#"CLUB_SHORT_NAME_CHANGE" 41005039 "PS TNI" ""
#"CLUB_LONG_NAME_CHANGE" 7742801 "Bali United FC" ""
"COMP_LONG_NAME_CHANGE" 41004312 "GO-JEK Liga 1" ""
"COMP_SHORT_NAME_CHANGE" 41004312 "Liga 1" ""
"COMP_LONG_NAME_CHANGE" 5624536 "unifi Liga Super Malaysia" ""
"COMP_SHORT_NAME_CHANGE" 5624536 "Liga Super" ""
"COMP_LONG_NAME_CHANGE" 5624996 "Shopee Piala FA Malaysia" ""
"COMP_SHORT_NAME_CHANGE" 5624996 "Piala FA" ""
"COMP_LONG_NAME_CHANGE" 5624972 "unifi Piala Malaysia" ""
"COMP_SHORT_NAME_CHANGE" 5624972 "Piala Malaysia" ""
Just to let you know, this fix makes Scottish championship broken/not selectable upon starting new save. Thanks for those @Bram Carella, they'll be included in the next version of this download. 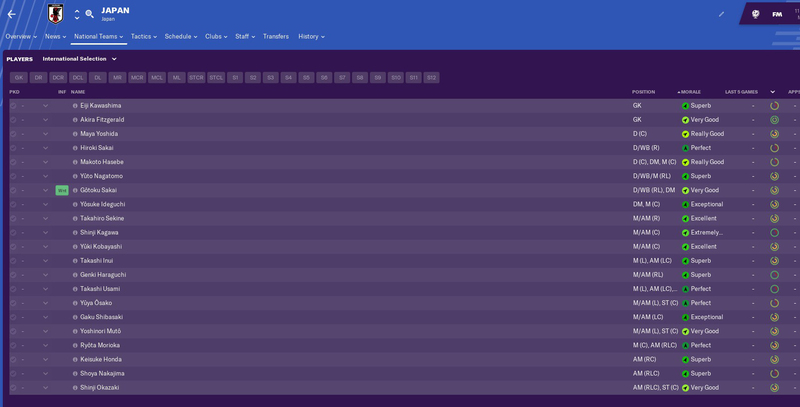 This file doesn't do any changes at all to league setups, just the names and through a mechanism which doesn't affect anything other than the names, so whatever is the issue, I very much doubt how these files can be affecting the Scottish Championship or any other leagues/divisions. Are you running any other editor data files alongside this perchance? Maybe that's the cause. @FmEnthusiast, please ask in the 3D kits forum; that's got nothing to do with this file - why are you posting it here?? 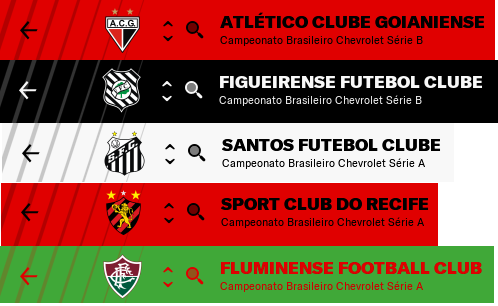 Chevrolet/SIL will not be the headline sponsor of the Campeonato Brasileiro this season. 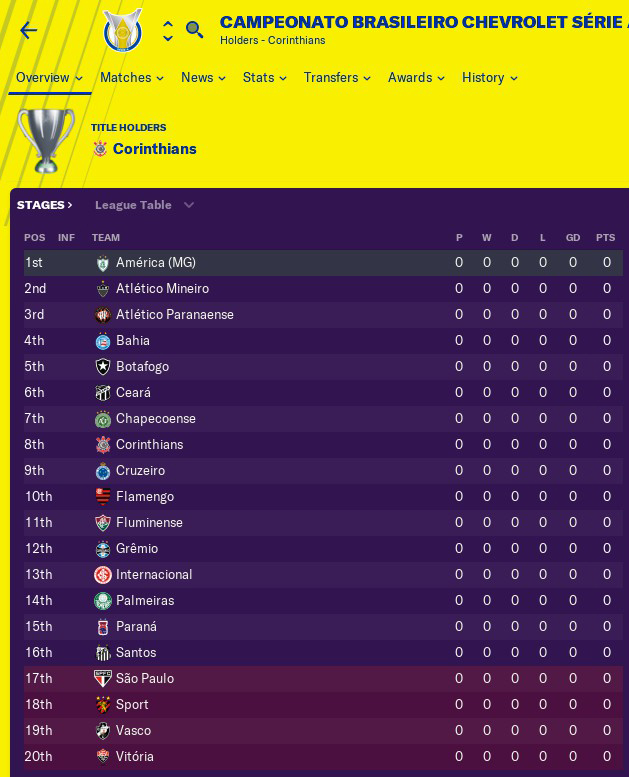 "COMP_LONG_NAME_CHANGE" 102423 "Campeonato Brasileiro de Futebol Série A" ""
"COMP_SHORT_NAME_CHANGE" 102423 "Campeonato Brasileiro Série A" ""
"COMP_LONG_NAME_CHANGE" 107191 "Campeonato Brasileiro de Futebol Série B" ""
"COMP_SHORT_NAME_CHANGE" 107191 "Campeonato Brasileiro Série B" ""
"COMP_LONG_NAME_CHANGE" 107192 "Campeonato Brasileiro de Futebol Série C" ""
"COMP_SHORT_NAME_CHANGE" 107192 "Campeonato Brasileiro Série C" ""
"COMP_LONG_NAME_CHANGE" 19127222 "Campeonato Brasileiro de Futebol Série D" ""
"COMP_SHORT_NAME_CHANGE" 19127222 "Campeonato Brasileiro Série D" ""
FOOTBALL MANAGER 2019 FIX NAME TEAMS !!!!!!!!!!!!!!!!!!!!!!!! #"CLUB_LONG_NAME_CHANGE" 2185 "Società Sportiva Arezzo" ""
#"CLUB_SHORT_NAME_CHANGE" 2185 "S.S. Arezzo" ""
It seems that large editor data files (such as the media file in this download) cause the game to start up a new save game quite slower than we're used to. Once it's started, however, there are no further slowdown issues. It's an FM issue rather than related to this file, so we're hopeful that a hotfix sorts this issue out in the near future. 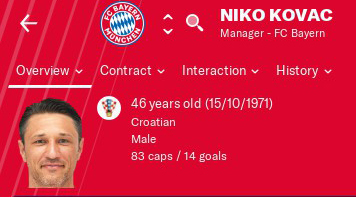 #"CLUB_LONG_NAME_CHANGE" 2185 "S.S Arezzo" ""
If I only want to fix the Bayern Munich manager name and the Japanese national team what files do i need to use? 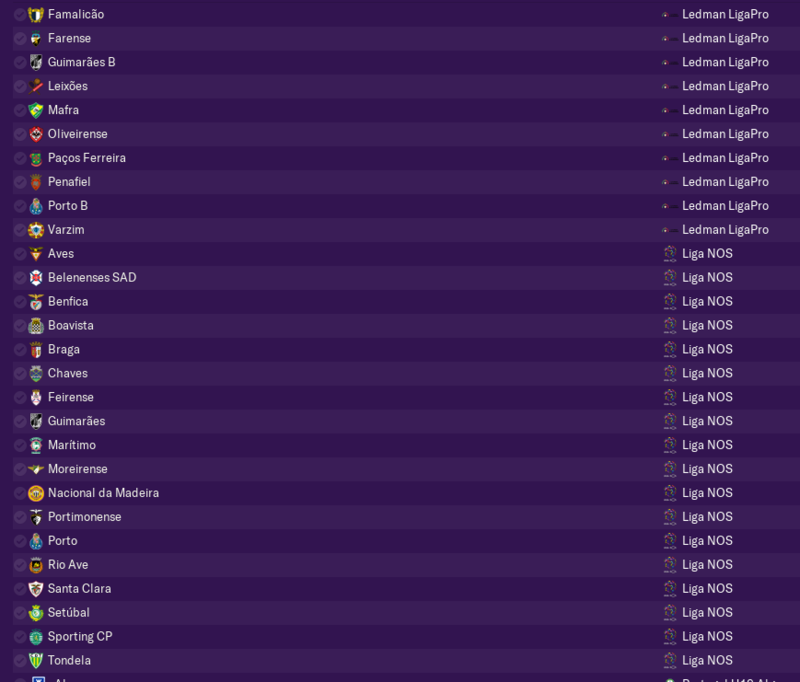 Also I saw it mentioned that one of the files originally in FM forces Holland to call up certain players, why does it do this? Delete the fake.edt file from the edt/permanent folder and the all and greek folders from within the lnc folder. Should do the trick, I think. Licensing reasons, I believe. This is the SI_team_Holland.ddt (not 100% sure that's the exact name but it'll be close) in the edt/permanent folder. Delete it too and you'll be fine. Thank you, am I correct in believing there aren't any other national teams that don't call up the right players and their are no other fake player names. 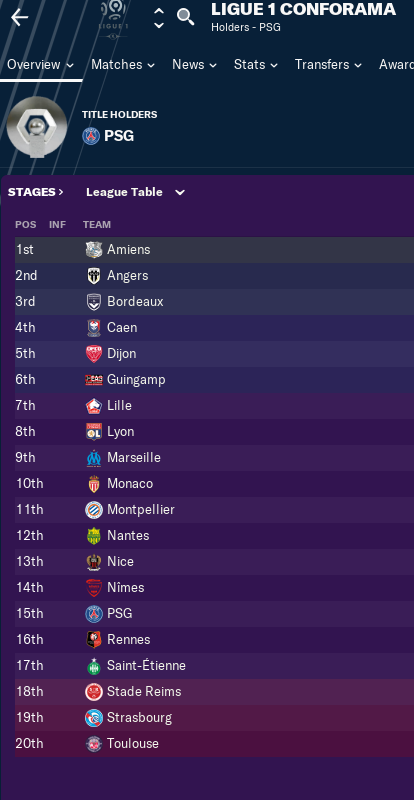 I understand some of the club/competition/award/stadium etc names are not all correct in the original game but i am fine with that. Great work with this years fix btw, I use your file most years and I know you put a lot of effort into it. "CLUB_SHORT_NAME_CHANGE" 107201 "América Mineiro" ""
"CLUB_SHORT_NAME_CHANGE" 339 "Vasco da Gama" ""
"CLUB_LONG_NAME_CHANGE" 302142 "Esporte Clube São Bento" ""
"CLUB_SHORT_NAME_CHANGE" 302142 "São Bento" ""
"CLUB_SHORT_NAME_CHANGE" 107236 "Vila Nova" ""
"CLUB_LONG_NAME_CHANGE" 1687 "Atlético de Madrid" ""
"CLUB_LONG_NAME_CHANGE" 1678 "C.D. Leganés" ""
"CLUB_LONG_NAME_CHANGE" 1688 "Deportivo Alavés" ""
"CLUB_LONG_NAME_CHANGE" 1710 "Getafe C.F." ""
"CLUB_LONG_NAME_CHANGE" 814089 "Girona C.F." ""
"CLUB_LONG_NAME_CHANGE" 1717 "Levante U.D." ""
"CLUB_LONG_NAME_CHANGE" 1747 "Real Valladolid C.F." ""
"CLUB_LONG_NAME_CHANGE" 1729 "Rayo Vallecano" ""
"CLUB_LONG_NAME_CHANGE" 1724 "R.C. 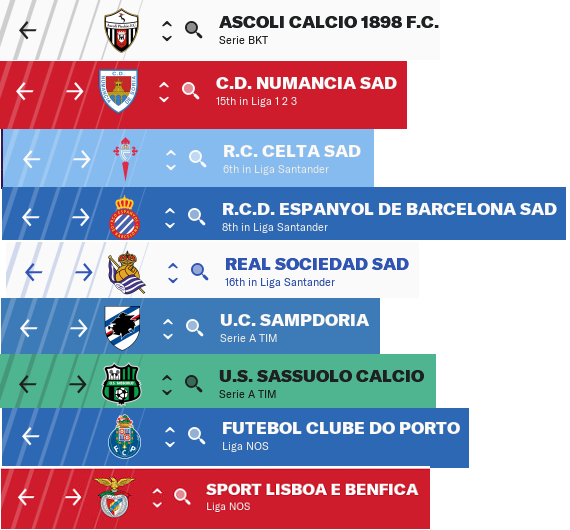 Celta" ""
"CLUB_LONG_NAME_CHANGE" 1725 "RCD Espanyol" ""
"CLUB_LONG_NAME_CHANGE" 1733 "Real Betis" ""
"CLUB_LONG_NAME_CHANGE" 1742 "Real Sociedad" ""
"CLUB_LONG_NAME_CHANGE" 1753 "S.D. Eibar" ""
"CLUB_LONG_NAME_CHANGE" 4212294 "S.D. Huesca" ""
"CLUB_LONG_NAME_CHANGE" 1759 "Sevilla F.C." ""
"CLUB_LONG_NAME_CHANGE" 1775 "Valencia C.F." ""
"CLUB_LONG_NAME_CHANGE" 1777 "Villarreal C.F." ""
"CLUB_LONG_NAME_CHANGE" 810090 "A.D. Alcorcón" ""
"CLUB_LONG_NAME_CHANGE" 1660 "Albacete B.P." ""
"CLUB_LONG_NAME_CHANGE" 1685 "C.A. Osasuna" ""
"CLUB_LONG_NAME_CHANGE" 1682 "Cádiz C.F." ""
"CLUB_LONG_NAME_CHANGE" 1695 "C.D. Lugo" ""
"CLUB_LONG_NAME_CHANGE" 1699 "C.D. Numancia" ""
"CLUB_LONG_NAME_CHANGE" 1680 "C.D. Tenerife" ""
"CLUB_LONG_NAME_CHANGE" 4212228 "C.F. Rayo" ""
"CLUB_LONG_NAME_CHANGE" 4212272 "C.F. Reus" ""
"CLUB_LONG_NAME_CHANGE" 1704 "Córdoba C.F." ""
"CLUB_LONG_NAME_CHANGE" 1707 "Elche C.F." ""
"CLUB_LONG_NAME_CHANGE" 1714 "Granada CF" ""
"CLUB_LONG_NAME_CHANGE" 2096 "Málaga CF" ""
"CLUB_LONG_NAME_CHANGE" 4203006 "Gimnàstic de Tarragona" ""
"CLUB_LONG_NAME_CHANGE" 1741 "Real Oviedo" ""
"CLUB_LONG_NAME_CHANGE" 1749 "Real Zaragoza" ""
"CLUB_LONG_NAME_CHANGE" 1705 "R.C. Deportivo" ""
"CLUB_LONG_NAME_CHANGE" 1726 "R.C.D. Mallorca" ""
"CLUB_LONG_NAME_CHANGE" 1744 "Real Sporting" ""
"CLUB_LONG_NAME_CHANGE" 1661 "U.D. Almería" ""
"CLUB_LONG_NAME_CHANGE" 1772 "U.D. Las Palmas" ""